Charlotte’s Web and a Mystery! 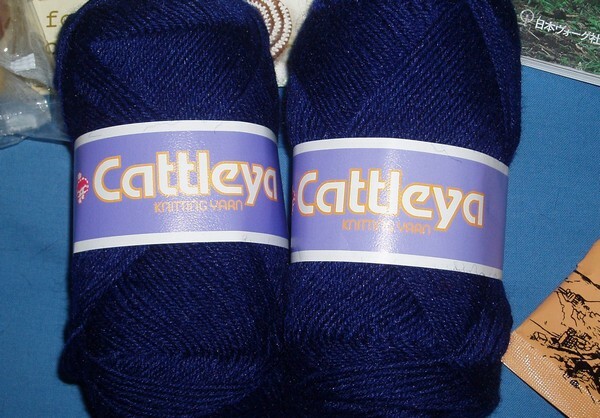 I got needles today to start my Charlotte’s Web shawl – a knitalong with most of FiberCult. Cathy is already almost done with hers, or maybe she is done by now. Amanda started already, I think, and Alexis and I are starting now. The other project I’m planning on starting now is the November Mystery Sock from the Ravelry group Sock Knitters Anonymous. I don’t know why, I always say I don’t like surprises, but I think I’m going to give it a shot. Today I got two amazing packages in the mail. 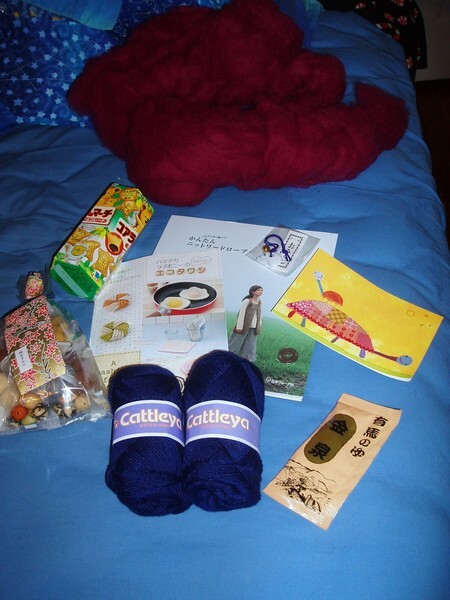 The first was a package of goodies from Kathleen in Japan. She contacted me via Ravelry to tell me how much she enjoys the podcast and asked if I wanted anything from Japan. Because I am always up for something new and exciting I said I would love to try Japanese sock yarn. She said it would be underwhelming, but it is certainly amusing! First off all, Cattleya is a very interesting name. It’s 50% wool and 50% nylon and looks like it will be a nice hard-wearing yarn, if not luxurious. Besides, what other chance would I have to knit with genuine Japanese sock yarn? AND (I know, it’s too much) she sent some edible goodies to share with the rest of the FiberCult! A *huge* thank you to you, Kathleen. I got some delicious chocolate, some beautiful stitch markers, and a skein of very pretty Fearless Fibers yarn. The yardage on it is really good so I’m thinking I should save it for some nice tall socks. 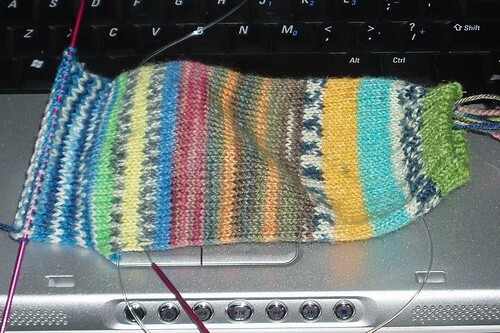 Ok, on to non-mail topics… I watched The Illusionist tonight while knitting on the Madder Rib socks and I loved it. 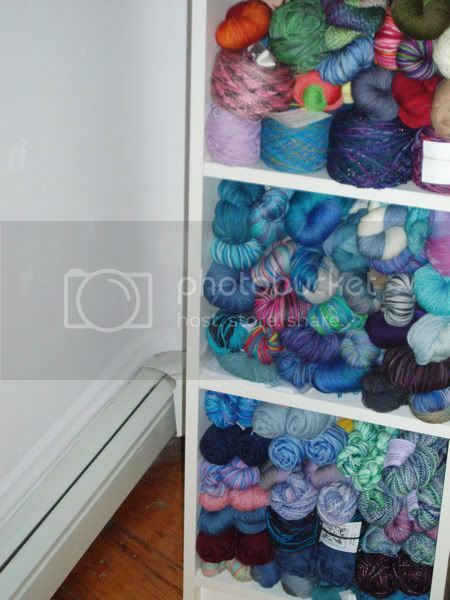 Also I got a Ravelry question about the method I use to knit my socks. I almost always knit my socks two at once using the magic loop method. 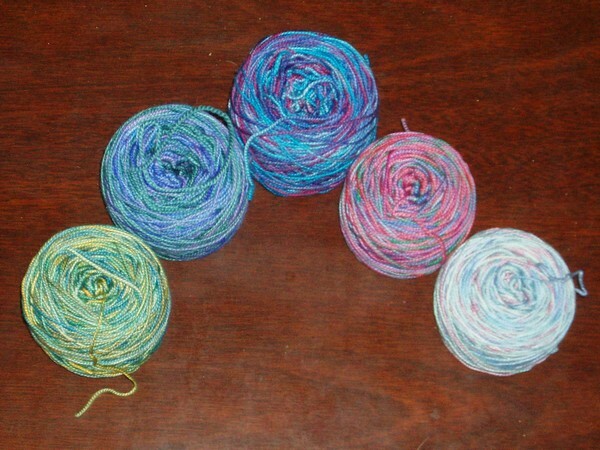 There is a really good tutorial on casting on (one of the tricky parts) on Sockbug here. The only thing to watch out for is patterns where the beginning of the round changes or there are non-paired increases and decreases that cause a decrease over the join. These aren’t impossible to knit using the 2-at-once-ML method, but IMO they’re more of a pain than it’s worth. 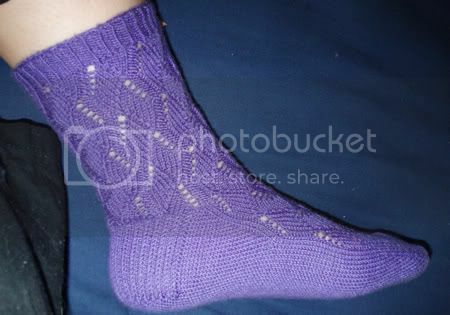 I did a tutorial a while back on how to turn the heel which is here. Now get knitting and don’t look back! Tonight I went over to Cathy’s for a bit of FiberCult recording with a few of the girls. I knit on my Frankensock and I wore my York. Yep, York made it’s debut today, although I discovered about 5 minutes after getting to work that seaming with the Kureyon was not a good plan. (OK, so I should have known that.) I was taking the sweater off and broke the seaming yarn on the bottom of the left sleeve. Luckily when I went to record tonight Cathy had some Cascade 22o in a dark green that matches pretty well so I’m going to re-seam the lower arm and keep a bit of Cascade for any further emergencies. Unfortunately I didn’t get any pictures since the lighting left a bit to be desired, but I should see many of my knitting friends on Saturday during the day for once, so I can coerce them into a little photo shoot then. Last night FiberCult minus Amanda got together to exchange our Secret Spook gifts. Alexis was my Spook and I was Catherine’s. At the moment that I’m writing they both have top posts about the Red Sox winning the World Series, but here you get a different type of socks. Those are the socks that I knit for Catherine. 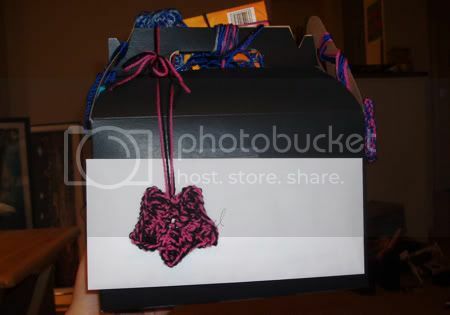 I didn’t think to get a picture of all of her package before I assembled it, so hopefully she will. There were also some cute pumpkin stitch markers, a candy corn candle, some assorted Halloween goodies (stickers, a pencil) and a little ghost bear. The (almost) purl-free Monkey socks knit for me by Alexis. Actually she gave me *two* pairs of socks! The other ones weren’t handknit, though. I also got candy corn tissues, a cute skeleton pail which doubled as gift packaging, glow in the dark nail polish (! 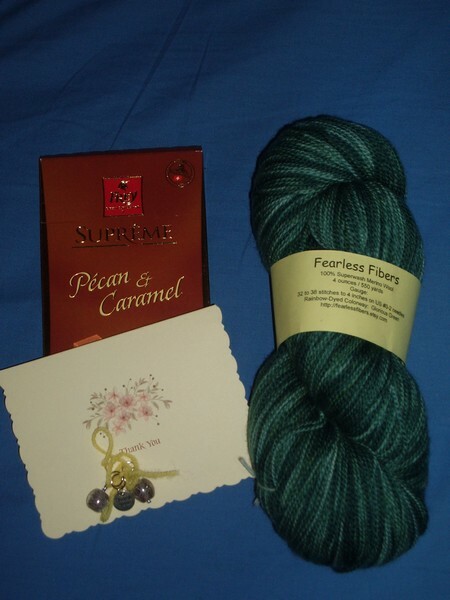 ), some yummy chocolate, and some lovely Alpaca Sox yarn, which I haven’t tried yet. The backdrop is a Halloween fleece blanket I picked up at Target on the Rhinebeck trip. I plan to use it year round (well, whenever I need a fleece blanket). First off, there’s a new episode of FiberCult up! I probably won’t keep updating here for all the episodes, so if you’re interested you can subscribe to that blog or to the RSS feed in iTunes (there are instructions on the FiberCult blog). Now, down to business! Over the weekend Cathy and I headed to IKEA and I picked up a bit of furniture for my room. I closed my bedroom door when I was leaving the house, and when I came back it wouldn’t open! My doorknob was apparently past it’s prime. 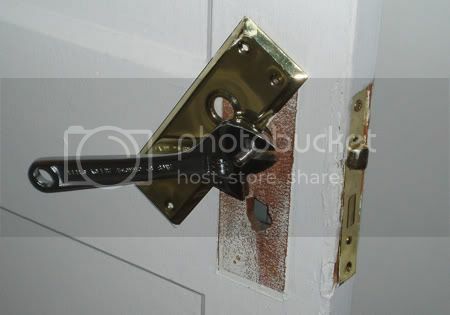 Luckily I was able to get my room open with this lovely contraption and hopefully I’ll have a new doorknob soon. Hope all of you have a lovely 4th of July. 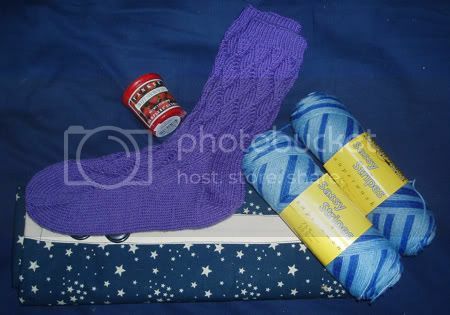 I’m heading out now to sit outside with friends, knit some socks, and watch fireworks when the time comes. Listening to: Move Together ~ AEC, Kill Caustic ~ A.F. I.
I got home today to find my belated birthday package from MJ. Now, let it be known that she did actually send me a package near the time of my birthday but due to address confusion it was returned and she sent it again – this time with a few extra goodies. Yes, she knit me socks! Waving Lace from Favorite Socks – and they fit great. 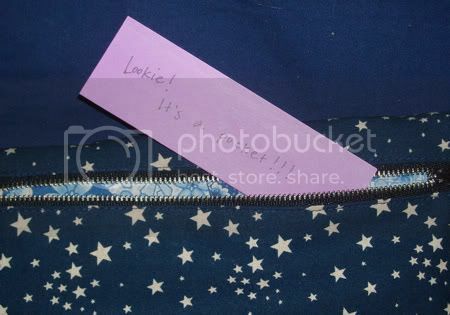 Thank you so much MJ! In other news, I finally got a picture of the sock I knit a while back. 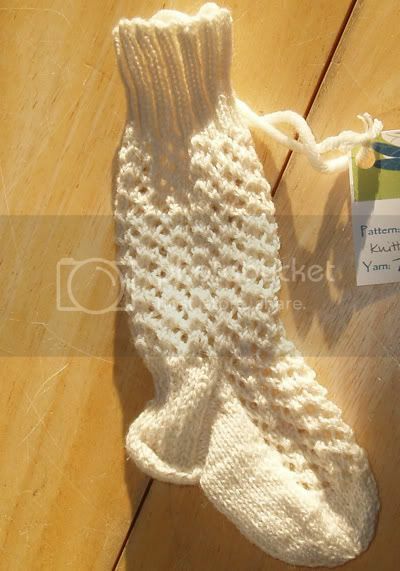 I knit a single sock because it was a store sample, but I’ve decided to count it in my KVS goal. In other news, here’s a picture of my Secret Solstice package from Cassandra – she has better pictures of the goodies on her blog including some awesome skull wristwarmers! And last but not least, a little word about the podcast. Thanks to all of you who have gone and listened to it so far! As of this moment we’ve had 72 listeners – not bad for the first couple days! I’ve heard some positive and some negative things so far – I know the sound quality is a bit echo-y (hopefully the addition of the couch to my living room will help with that!) and that the editing is not perfect. 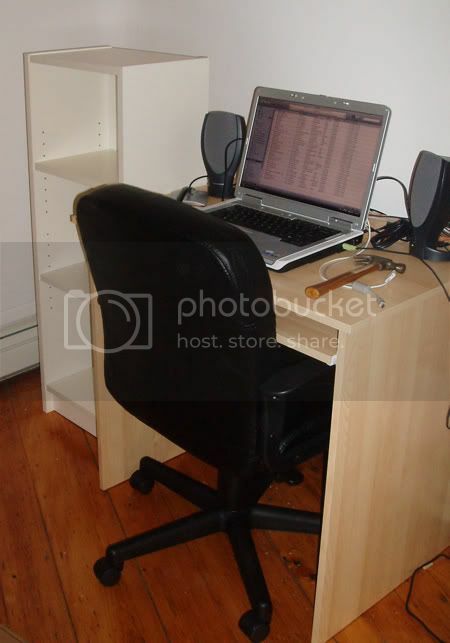 Unfortunately Audacity got mad at me during editing and made a few parts of the original file silent, so the editing was a little more severe than I had hoped. Oh, and next time we will make sure to put Amanda closer to the microphone! Ah well, live and learn right? Thanks for everyone who has given us kind words and encouragement! Right now I have a BIG announcement. FiberCult – a new podcast by six knitting girls from Boston (that would be Alexis, Amanda, me, Cassandra, Catherine, and Cathy). The first episode has just been uploaded so give it a listen and let me know what you think.